Will Kostakis, award winning author of The First Third, perfectly depicts the pain and pleasure of this teenage world, piecing together three points of view with intricate splendour. Isaac was charismatic, attractive with a smile that could illuminate any room. He was the son, the brother, the best friend and now a legacy to live each moment. Isaac leaves behind Ryan, Harley and Miles, their bond only existing through Isaac who had been the one connection all three boys at their private Catholic school had shared. The Swimmer, The Rebel and The Nerd. Carpe diem. The Sidekicks is a magnificent male narrative exploring the harrowing loss of a friend through grief, reflection and remembrance. It's often the quiet, unassuming reads that effect us most, it was beautiful. Isaac is a charismatic young man who the reader connects with through the memories and stories of his peers after his tragic passing. Three young men with one common factor, Isaac. Ryan is The Swimmer, an Olympic hopeful who's athleticism has afforded him a privileged position within the school. Ryan and Isaac shared a wonderful friendship based on trust, Isaac having kept Ryan's confidence until the very end. Ryan is gay and isn't yet comfortable sharing his sexual preferences with his peers for fear of persecution. Ryan often refers to himself as the third person, Ryan Patrick Thomson, Olympic hopeful and seen as a popular athlete with very little to offer academically. Harley is The Rebel, he self medicates with alcohol and his friendship with Issac was seemingly based upon addiction and dependence. Harley is a border at Barton House, his mother paying for his tuition after returning to the United States and abandoning him and his father. Underneath the coarse facade, Harley is deeply grieving the loss of his friend, rousing feelings of his mother's abandonment and returns home to his father. Miles is quietly intelligent and is now reflecting on his friendship with Issac, believing that their friendship was just one of convenience. Months before Issac died, the two formed a partnership to create a short film in which Miles was praised but is now obsessing over the hours of filming between takes, isolating himself within the media room and piecing together their friendship with a series of broken scenes. Ryan, Issac and Miles are three distinct individuals, all reeling over the loss of their friend. Their grief was palpable. Time is pulling is apart. With every second that passes, the space between us widens. Today, I saw him yesterday. In a few days, it will have been last week. Then, last month. And there is nothing I can do to keep time from wedging more of itself between us. It is inevitable. My heart. 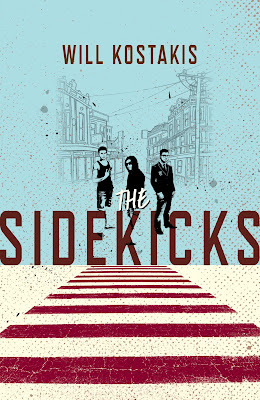 The Sidekicks is an honest, captivating and illumination of the male narrative of the many facets of grief, self doubt and the intricacy of male friendships. It was incredible. I enjoyed how the narrative was three separate, although interconnecting viewpoints surrounding the loss of Issac. I felt Ryan was the more engaging character, his narrative of losing the only person who he had confided in, the pressure of being an athlete and the casual homophobic slurs overheard from teachers and peers alike added to his anguish. 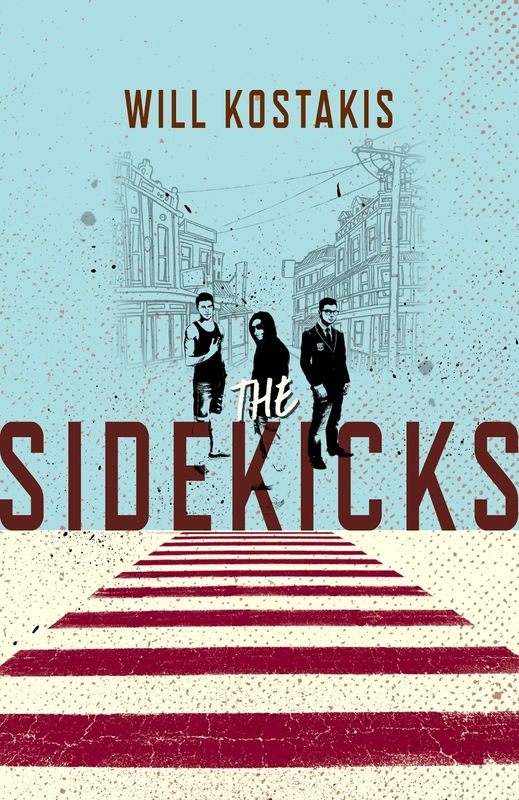 The Sidekicks is magnificent. Poignant, endearing and bittersweet, Will Kostakis is a remarkable author creating a narrative with a quiet intensity and conviction. I loved it. Immensely. Thanks Chuckles, I really appreciate it. This sounds beautiful. Definitely adding it to the TBR list. Lovely review. Thanks Karen. It's a magnificent read, poignant, entertaining and ultimately heartwarming. i'd love to see what you think of it. I love the premise of this one! It sounds fantastic. I think I'd really like Ryan's narrative too. It was brilliant Lauren and so effortless. Even being an Australian author, grief is so universal and I think most teens and adults alike will be able to relate to the feelings of sorrow and displacement. This sounds like such a wonderful novel <3 I might have to pick it up! It truly is Ellie, it was one of my favourites of twenty sixteen. Will Kostakis is a phenomenal author. I do hope you can grab a copy, it's also being published in the U.S this year too I believe. I picked this one up at the #YASquad tour earlier this year, but haven't heard anything about it. Probably because I haven't been around the blogosphere a lot this year, I digress. I'm really glad you enjoyed this one - I'm looking forward to reading it, great review! Thanks Ebony sweetheart. It's such a wonderful read, poignant and fascinating to experience grief from the male perspective. I can't wait to see what you think of it! This would be a fabulous book for young males. I love that each of the sidekicks sound as if they're far from that, but have fallen into believing that's the role they play! It's wonderful and I loved the play on words. All three have the same late boy in common and all seemingly lived within his larger than life shadow. I loved getting to know each unique character but none more so than Ryan. His narrative was emotional and poignant. I loved it immensely. The First Third, then this, I can't wait to see what YA masterpiece Kostakis comes up with next. You're the reason I picked this one up Sarah, after seeing hoe much you loved it. I've even already read The First Third as well. Will's writing is so effortless and flawless, like having a chat with an old friend. Ah I can't wait to read my copy. I ordered this especially because I've read a glowing review such as yours so I wanted to see where it's at. I'm so glad you loved it, too. I want to experience this for myself because I feel like i haven't read enough books in this vein this year. Looking forward to exploring grief in three perspectives. Thanks Joy darling. I think you'll really enjoy this one. Will's writing reminds me of early Marchetta, effortless and a pleasure to read. While you're waiting for this to release, see if you can track down a copy of The First Third, it's hilarious. sounds sad and interesting at the same time! it would be the first all boys kind of story, usually some girl would be involved in teen books. I will ask my library for this . Great idea Ailyn, perhaps they could order a few copies. It's rare to find an all male narrative in young adult, unless they're involved with one another. I loved this one immensely and would love to see what you thought of it. It really puts into perspective how fragile life can be, especially for young men who society still teaches them that crying and emotion isn't masculine. Such an important read in that aspect too. I think you'd really enjoy this one Verushka. I've actually just started reading this! I'm still in Ryan's first chapter at the moment, but the writing voice is so captivating. I'm so excited to see what you think of it Cilla and hope you've enjoyed it as much as I have too. I think you'd love both The Sidekicks and The First Third, which is incredibly funny. Both magnificent reads and would love to see what you think of them. Oh wow, this sounds SO good. It has been on my TBR since I heard about it, but WOW now I must read it ASAP. It sounds so beautiful and heartbreaking, I am DEFINITELY going to need to get it soon. Thanks so much for the lovely review! It's such an incredible read Shannon and it's also being published in the US soon too! Soon after The Sidekicks, I read Will's previous realise The First Third and my goodness, both significantly different but beautifully written. Incredible review, Kelly. Beautifully written and very convincing. Will Kostakis is a new to me author; A while ago Cait from Paper Fury highlighted his The First Third in one of her posts and put him on my radar. This sounds like a very different story. I plan to read both. I just can’t pass a well written male POV. I just finished The First Third as well and I couldn't agree more, both were absolutely amazing reads that I can't recommend highly enough! I'd love to see what you think of them. It was absolutely brilliant, definitely one to add to the to read list! Giveaway! Ho ho ho, merry SPARKmas!